At Globecomm we spend as much time as possible talking to shipowners about their communications needs. It’s always a rewarding conversation because we hear about what they actually do with bandwidth, which gives us insight into what systems and solutions might suit them best. Over the last decade that would almost always mean L-Band satellite systems; but this is changing. These days the conversation might start at L but more often than not it ends at V. VSAT has changed too. From expensive, complex to buy, install and operate, and sometimes quite constrained in actual throughput, VSAT is fast becoming the new L-Band as far as many shipping customers are concerned - simple, affordable and flexible. VSAT can solve many connectivity issues at a stroke: higher bandwidth, better speed and greater availability to name just three. It’s a highly effectively way of increasing capacity and enabling the data to flow, though it does need more attention to bandwidth management and understanding of how to get the best out of applications and processes that drive more connected operations. Here are five reasons why the owners we speak to are increasingly interested in the Globecomm global Ku-Band VSAT service. Vessel operators are constantly looking for ways to optimize efficiency, reduce costs and improve profitability, a combination of requirements that requires embracing new technologies while also managing investment risk. The opportunity afforded by better ship-shore connectivity is the most direct pathway to achieving these improvements, and operators are adopting the tools; data collection and analysis, fleet management and video monitoring. And at the higher level, enhanced connectivity is able to help owners do what they must do above all: retain their customers. In a digital business environment, that means providing increasing visibility on vessels, cargoes, arrivals and departures, even carbon and other emissions. Once exotic notions, provision of such information is now the price of doing business for serious operators. To realize the opportunities of smart shipping means overcoming historical resistance to an increased focus – and therefore spending – on communications. In fact, the majority of maritime communications users these days recognize that not only has the cost of maritime communications fallen consistently for a decade, but that spending on better connectivity can drive value into their operations. To do this takes commitment to understanding business requirements; which services fit what profile and how they can be managed so as to control costs while unlocking the potential of new applications and greater bandwidth. Costs still need to be managed – there are plenty of examples of owners installing VSAT technology and quickly finding their systems overloaded and their ‘unlimited’ or ‘all you can eat’ plans come with caveats. A clear view of usage needs can avoid this issue. Perhaps the most important factor in embracing new technology in shipping is to properly understand how enhanced communications can support smarter operations. In most cases, it will mean greater collection of data – whether for regulatory compliance or for performance monitoring. Traditionally, the data needs of many shipping companies have been small – at least in comparison to other industries. For some basic processes that will continue, but the availability of lower cost bandwidth is driving new applications such as video and real-time voyage monitoring that will increase the data load. Applications in the front of bridge space – notably navigation charts - are driving the need for bandwidth while at the back of bridge, demand is exploding. Here, the use of fleet and voyage management systems, next generation weather routing and secondary management services are all further increasing demand. 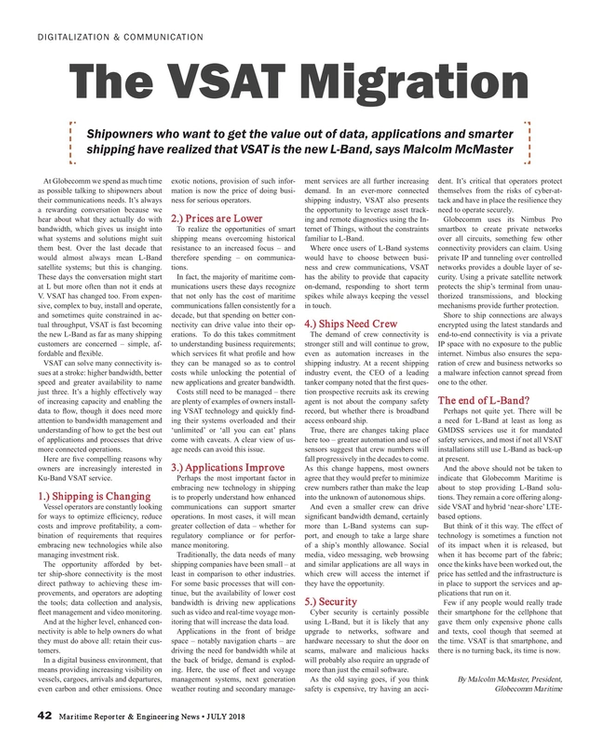 In an ever-more connected shipping industry, VSAT also presents the opportunity to leverage asset tracking and remote diagnostics using the Internet of Things, without the constraints familiar to L-Band. Where once users of L-Band systems would have to choose between business and crew communications, VSAT has the ability to provide that capacity on-demand, responding to short term spikes while always keeping the vessel in touch. The demand of crew connectivity is stronger still and will continue to grow, even as automation increases in the shipping industry. At a recent shipping industry event, the CEO of a leading tanker company noted that the first question prospective recruits ask its crewing agent is not about the company safety record, but whether there is broadband access onboard ship. True, there are changes taking place here too – greater automation and use of sensors suggest that crew numbers will fall progressively in the decades to come. As this change happens, most owners agree that they would prefer to minimize crew numbers rather than make the leap into the unknown of autonomous ships. And even a smaller crew can drive significant bandwidth demand, certainly more than L-Band systems can support, and enough to take a large share of a ship’s monthly allowance. Social media, video messaging, web browsing and similar applications are all ways in which crew will access the internet if they have the opportunity. Cyber security is certainly possible using L-Band, but it is likely that any upgrade to networks, software and hardware necessary to shut the door on scams, malware and malicious hacks will probably also require an upgrade of more than just the email software. As the old saying goes, if you think safety is expensive, try having an accident. It’s critical that operators protect themselves from the risks of cyber-attack and have in place the resilience they need to operate securely. Globecomm uses its Nimbus Pro smartbox to create private networks over all circuits, something few other connectivity providers can claim. Using private IP and tunneling over controlled networks provides a double layer of security. Using a private satellite network protects the ship’s terminal from unauthorized transmissions, and blocking mechanisms provide further protection. Shore to ship connections are always encrypted using the latest standards and end-to-end connectivity is via a private IP space with no exposure to the public internet. Nimbus also ensures the separation of crew and business networks so a malware infection cannot spread from one to the other. Perhaps not quite yet. There will be a need for L-Band at least as long as GMDSS services use it for mandated safety services, and most if not all VSAT installations still use L-Band as back-up at present. And the above should not be taken to indicate that Globecomm Maritime is about to stop providing L-Band solutions. They remain a core offering alongside VSAT and hybrid ‘near-shore’ LTE-based options. But think of it this way. The effect of technology is sometimes a function not of its impact when it is released, but when it has become part of the fabric; once the kinks have been worked out, the price has settled and the infrastructure is in place to support the services and applications that run on it. Few if any people would really trade their smartphone for the cellphone that gave them only expensive phone calls and texts, cool though that seemed at the time. VSAT is that smartphone, and there is no turning back, its time is now.